Before starting their search for an org charting and data analytics tool, Dana Lautenschlaeger, Senior Expert HR Processes, Projects & Systems at Conrad Electronic SE, and her colleagues defined the following essential requirements: Easy integration into the HR system SAP SuccessFactors, comprehensive display options, responsive design and the possibility to simulate structural reorganizations. These features would pave the way for a more efficient HR management practice of 4.000 employees spread across Europe. Finally, Conrad found everything they were looking for in a product by Ingentis: Thanks to its extensive feature set, the software Ingentis org.manager for SF was able to fulfill all of the mentioned needs. In the spring of 2017, Conrad started the application’s launch in Germany. Founded in Berlin in 1923, the family business Conrad is today regarded as one of Europe’s leading omni-channel suppliers for technical products and components. The online shop for private customers offers up to 750,000 items. In addition, the company just recently launched the Conrad Marketplace conrad.biz in response to its business customers’ increasing requirements and needs, currently resulting in a total of 900,000 products. In order to maintain the great variety of products as well as their high quality, Conrad relies on a strong team. Today, the company consists of 4,000 employees that work all across Europe. A staff of this scope calls for efficient and pragmatic HR management. It is the only way to keep the wheels of Conrad properly spinning round. This is why Conrad chose to use SAP SuccessFactors as their HR system. It runs on the SAP Cloud Platform and unites several HR management tools in one place, thus providing more efficiency, reliability, speediness as well as higher data quality. On the downside, the native org charting solution’s ability to visualize hierarchy structures was limited. For example, the tool only allowed for the display of a single structure type, the position type. Further, neither the offset arrangement of administrative departments, nor the simulation of reorganizations or the optimized display of org charts on mobile devices were possible. At this point, it became clear that Conrad needed a software add-on. Dana Lautenschlaeger had already heard of the on-premises version of Ingentis org.manager in the past. After receiving several recommendations, e.g. by SAP, for the cloud-based application Ingentis org.manager for SF, Conrad decided to give it a try. Ingentis org.manager for SF is an extension of the org charting software Ingentis org.manager that was specifically designed for and is seamlessly integrated into SAP SuccessFactors. It is able to draw data from Employee Profile as well as from Employee Central. Organigrams by Ingentis org.manager for SF are created in a fully automated way and in real time, based on the linked HR system’s data. As a result, the org charts are always up-to-date. 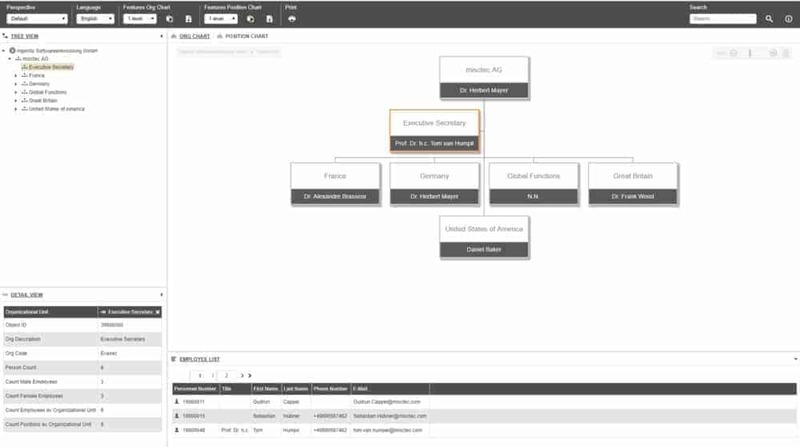 An org chart’s design and content as well as object and structure types can easily be adjusted to the customer’s wishes via the administrative user interface. In the case of SAP SuccessFactors, Ingentis org.manager for SF offers the object types business unit, division, department, position and employee. In addition to this variety of object types, Conrad makes use of the possibility of alternatively arranging positions. For example, to emphasize their special role in the company, the administrative departments have offset positions in the org chart. Another of Conrad’s requirements was the fulfillment of their „Mobile & Cloud First“ concept. It is based on the fact that the corporation’s management and HR staff is often on the road with only a mobile device at hand which comes with a smaller display than that of a desktop computer. Naturally, the mobile access to the cloud system SAP SuccessFactors is a given. It is thanks to the add-on Ingentis org.manager for SF that the organogram can be displayed in a responsive design. Hence, enabling an unlimited, user-friendly access to the organizational structure as well as to important HR data even when not at the office. After making themselves familiar with Ingentis org.manager for SF, Conrad is planning a second phase to launch the application’s modeling feature. Due to a very flexible org structure, the corporation is able to react quickly to changes. By simulating possible restructuring scenarios, Conrad will be able to perform more efficient workforce planning. In the past, Conrad relied on popular drawing programs. Unfortunately, this attempt to simulate structural reorganizations mostly resulted in time-consuming sketching processes that couldn’t provide the necessary clarity and overview. 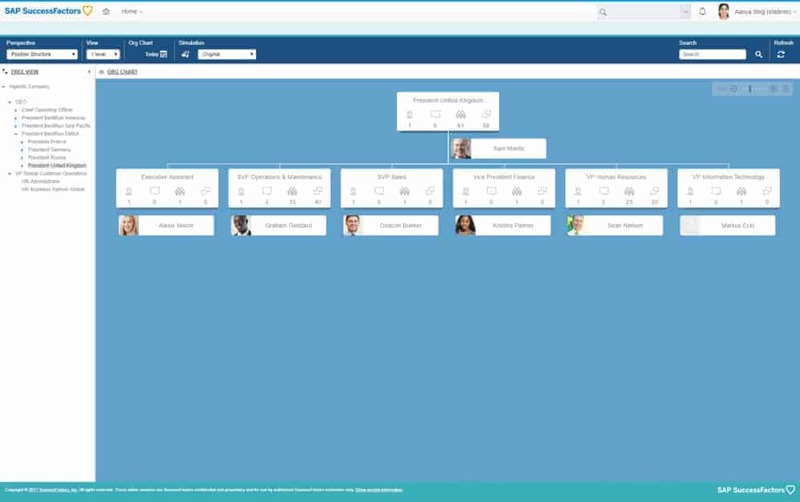 Ingentis org.manager for SF allows for the performance of simulations directly in the org chart without affecting the core data in SAP SuccessFactors. Objects can be created, edited, deleted or moved via drag&drop. If required, the simulated changes can be pushed back to the HR system within seconds in a manual or semi-automated way.